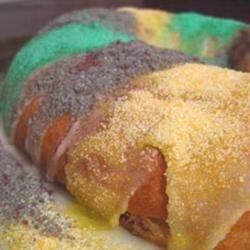 "I wanted to make a Mardi Gras King Cake for my friends because we are expatriates in Malaysia with no bakeries that can make them, and some people we know have never even tried one! However, I wanted to make it lighter too, so I made some substitutions and created my own cake that appears and tastes decadent, but is actually quite light. Bakeries in Louisiana do standard cinnamon-sugar fillings, but they do all kinds of other fruit/pudding fillings, too, so I decided to go fruity. Laissez les bon temps rouler! Add some edible beads for further decoration if you can find them!" Heat 3/4 cup milk in a small saucepan over medium heat until simmering, stirring constantly. Remove saucepan from heat and stir in 1/4 cup margarine. Allow mixture to cool until lukewarm. Using the bread hook with an electric mixer, mix together the self-rising flour, yeast, and sugar and sucralose blend in a large mixing bowl. Stir the water, egg, and warm milk into the yeast mixture using the electric mixer; stir well to combine. Gradually stir in half of the whole wheat flour until no dry spots remain. Stir in the remaining flour, a 1/2 cup at a time, mixing well after each addition. Cover dough with a damp cloth and allow to rest for 10 minutes. Mix the cream cheese, bananas, and pineapple together in a bowl. Stir in the pineapple extract and 3 packets of sweetener; mixture will be lumpy. Roll the dough out to about 9x12-inches. Spread the banana filling about 2-inches away from one of the longer edges. Roll the dough into a cylinder shape, beginning with the edge without filling. Shape the dough into a ring by bringing the two open edges together; pinch to seal. Wipe any filling from the outside of the ring. Cover with a damp cloth and allow to rise for 30 minutes more. Transfer the dough ring to a greased and floured baking sheet. Bake in the preheated oven until browned, about 20 minutes. Mix 1 tablespoon margarine with confectioners' sugar in a small bowl. Stir in the remaining milk 1 tablespoon at a time until the mixture is easily drizzled. Drizzle about 1/4 of the icing over the cooled cake. Divide the remaining icing into 3 small bowls. Stir in the green food coloring into one bowl; stir the yellow food coloring into the next bowl; and stir the purple food coloring into the last bowl. Drizzle each of the colored icings over the cake. Watch how to make this festive Mardi Gras cake. Very good! Think if I make it again will replace the butter with apple sauce!